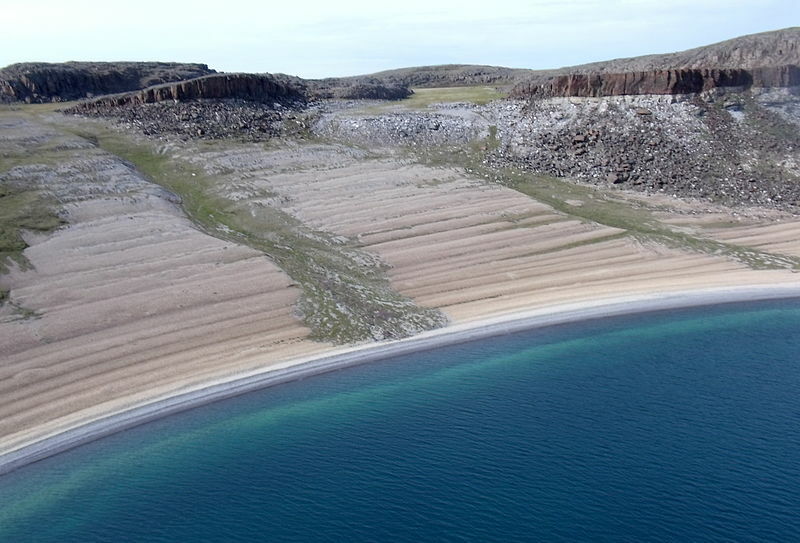 Our Image of the Week represents a layered beach located in Nunavut, in the Canadian Arctic. This specific landform is caused by the glacial rebound of the Arctic coastline resulting from the response of the lithosphere to the melting of the Laurentide Ice sheet, an ice sheet that used to cover the North American continent until less than 10 000 years ago. Imagine sitting on a very comfy couch, watching a movie. At the end of the movie, the couch has perfectly adapted to the shape of your body. Once you get up, you’re still able to see where you’ve been sitting, as the couch takes a little time to get back to its original form. Well… this is exactly what happens with the Earth’s crust and mantle. To understand this, you need to visualize the internal structure of our planet Earth, which is layered in spherical shells: under our feet lie the rocky tectonic plates, which constitute the Earth’s crust. These crusty plates – whose thickness varies between a few kilometers under oceans to a few tens of kilometers under the continents – are floating on a viscous layer, called the mantle. It is almost 3000 kilometers thick and actually slowly flows like a liquid, at a speed of a few centimeters per year. Even though the Earth’s crust is a very strong material, the pressure applied by an ice sheet thick of several kilometers is so important that the crust will locally deform under the heavy ice mass, sinking down into the viscous mantle. That’s what happened over large areas of the Northern Hemisphere that were covered by ice masses during the last ice age, and what is still happening in the remaining ice sheets of Greenland and Antarctica, which have been depressing the Earth’s crust beneath them for thousands of years. Just like for the couch in the example above, when the weight is removed, the mantle rebounds, carrying with it the overlying crust. Over the 20 000 years since the last glacial maximum, lands now relieved of their previous ice-burden are gradually rebounding. 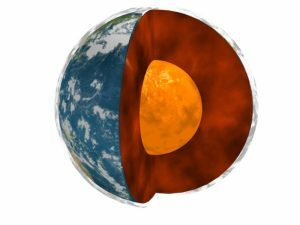 The Earth’s delayed response to the variation of mass on its surface is explained by the viscous character of the Earth’s mantle. Why is it important to take it into account? Even though the Siberian, Scandinavian and Laurentide ice sheets melted several thousands of years ago (causing a rise in global sea level), these regions that were previously glaciated are still locally emerging to compensate the loss of their overlying weight. The level of the coastline relative to the local sea-level thus increases. One says that the “relative sea level” is falling, and this at a rate that is essentially determined by the rate of the post-glacial rebound (which can exceed 1 cm/year in some areas, as shown in the figure below!). The rates of relative sea level can be influenced even at sites that are quite far away from the centres of the last glaciation, although it is much less significant. A good understanding of glacial isostatic adjustment is important to distinguish the different components and contributors to a local sea-level evolution: what part is due to the uplift of the land? And what part is due to the rising of global sea-level? In addition, glacial isostatic adjustment also impacts the behaviour of modern Greenland and Antarctic ice sheets. 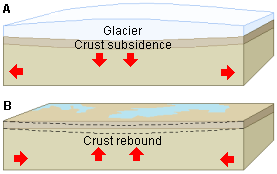 By influencing the geometry of the underlying bedrock, it will impact the sensitivity of the ice sheet to global warming and thus the glacial isostatic adjustment itself: this is a vicious circle! The problem is that glacial isostatic adjustment also depends on the local properties of the Earth’s crust and mantle, which are not constant at the Earth’s surface. A lot of work is still needed to understand all of this properly. Luckily, since NASA launched GRACE – a satellite mission that maps variations in the Earth’s gravity field – in 2002, scientists have observations they can use to constrain their models and improve their understanding of this complicated matter. Peltier, W.R. (2004). “Global Glacial Isostasy and the Surface of the Ice-Age Earth: The ICE-5G(VM2) model and GRACE”, Ann. Rev. Earth Planet. Sci., 32, 111-149. 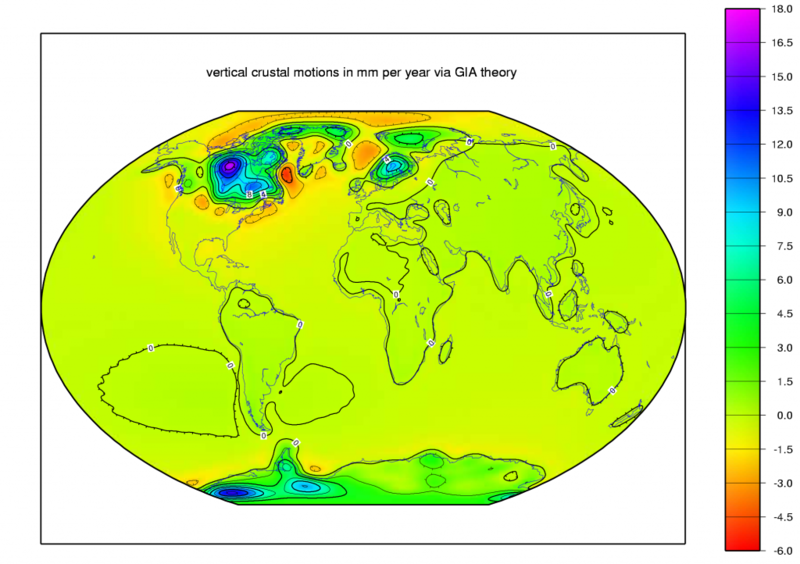 A, G., J. Wahr, and S. Zhong (2013) “Computations of the viscoelastic response of a 3-D compressible Earth to surface loading: an application to Glacial Isostatic Adjustment in Antarctica and Canada“, Geophys. J. Int., 192, 557–572, doi: 10.1093/gji/ggs030. Whitehouse et al. (2019) “Solid Earth change and the evolution of the Antarctic Ice Sheet”, Nature Communications, 10: 503, doi: doi.org/10.1038/s41467-018-08068-y. Fig.1: Mooring in the fjord next to Qaanaaq [Credit: Measurement campaign team]. In January 2017, a few German and Danish sea-ice scientists traveled to Qaanaaq to set up different measurement instruments on, in and below the sea ice covering the fjord near Qaanaaq. While in town, they stayed in the station ran by the Danish Meteorological Institute. After a few weeks installation they traveled back to Europe, leaving the instruments to measure the sea-ice evolution during end of winter and spring. 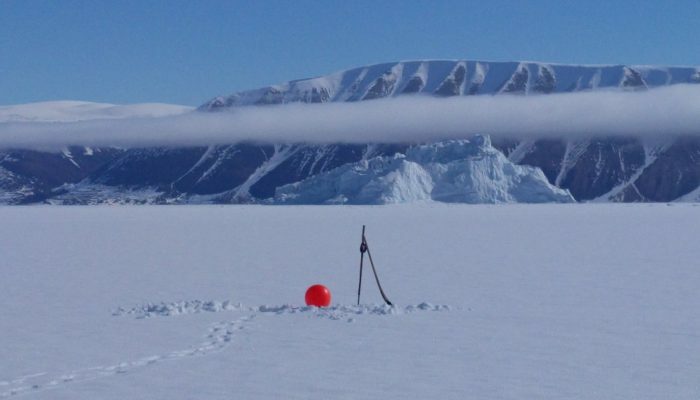 The goal of the measurement campaign was to measure in a novel way the evolution of the vertical salinity and the temperature profiles inside the sea ice, and the evolution of the snow covering the ice. 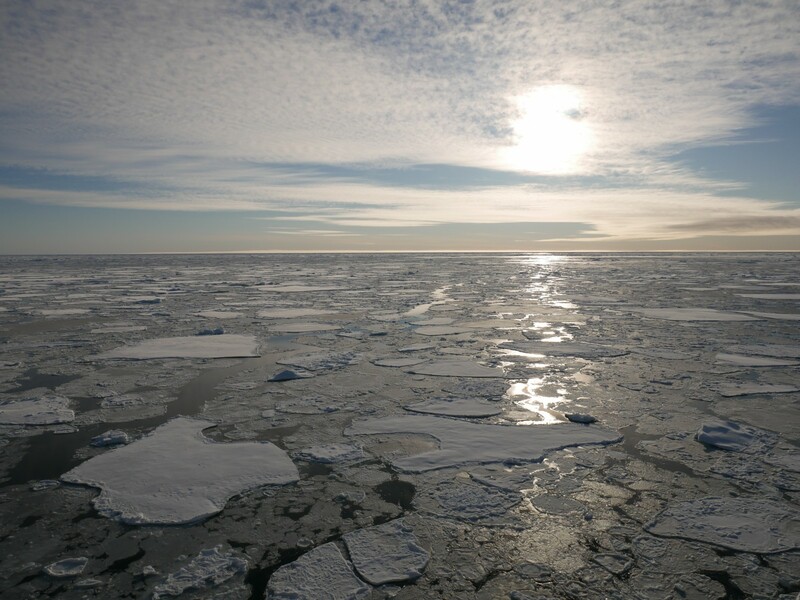 These variables are not measured often in a combined way but are important to understand better how the internal properties of the sea ice evolve and how it affects or is affected by its direct neighbors, the atmosphere and the ocean. The team had to find a place remote enough from human influence, and with good ice conditions. As there are only few paved roads in Qaanaaq, cars are not the best mode of transport. The team therefore traveled a couple of hours on dog sleds (in the dark and at around -30°C! ), with the help of local guides and their well-trained dogs (see Fig. 2 and 3). Fig. 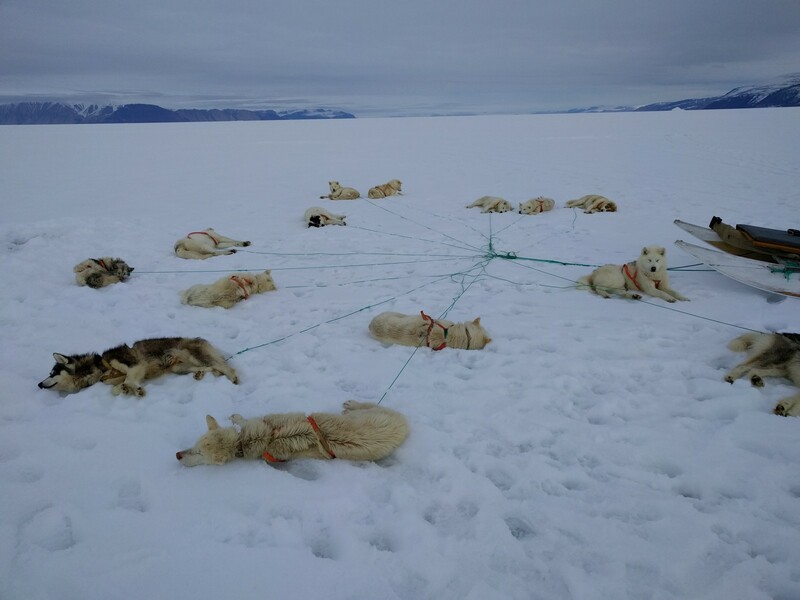 2: While the humans were working, the dogs could take a well-deserved break [Credit: Measurement campaign team]. Once on the spot, the sea-ice measurement device was introduced into the ice by digging a hole of 1m x 1m in the ice, placing the measurement device in it, and waiting until the ice refroze around it. Additionally, a meteorological mast and a few moorings were installed nearby (see Image of the Week and Fig. 3) to provide measurements of the atmospheric and oceanic conditions during the measurements. Further, a small mast was installed to enable the data to be transferred through the IRIDIUM satellite network. Fig. 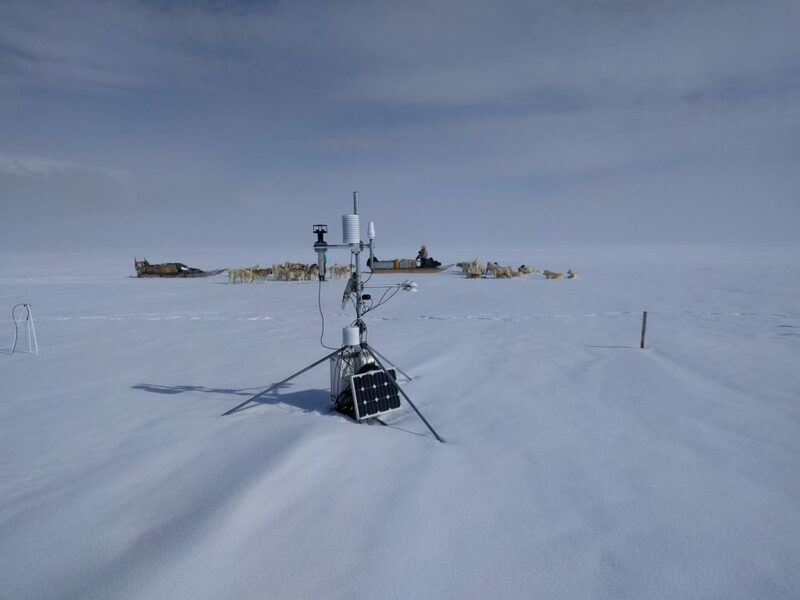 3: Small meteorological mast with dog sleds in the background [Credit: Measurement campaign team]. Finally, the small instrument family was left alone to measure the atmosphere-ice-ocean evolution for around four months. After this monitoring period, in May, the team had to do this trip all over again to get all the measurement devices back. 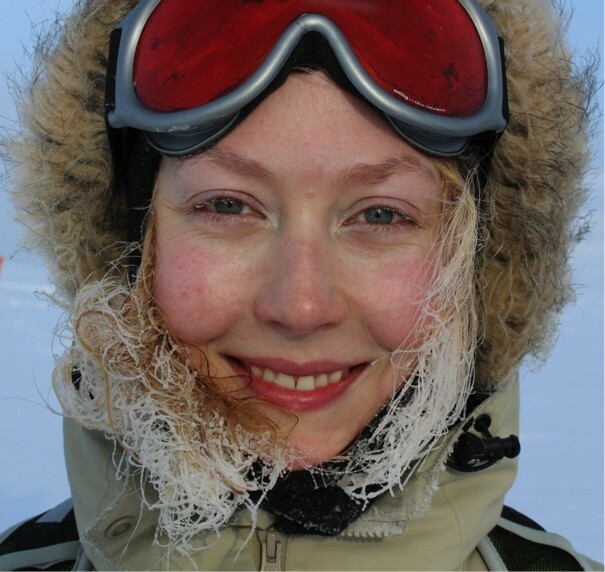 Studying Greenlandic sea ice is quite an adventure! A brief guide to Navigating EGU 2018! The sun sets over the Austria Center Vienna. where the 2018 EGU General Assembly will be held between the 8th - 13th April [Credit: Nanna B. Karlsson]. Are you going to the EGU General Assembly in Vienna in just over a week? If so, read on for a quick guide to navigating the week: Where to start, what to see and how to meet people and enjoy yourself! After all, the meeting is as much about the opportunities to meet scientists from all over the world as it is about the science itself. How on Earth do I know what is going on?! The EGU General Assembly is a massive meeting with many parallel session, short courses, medal lectures and much more. So how do you know what is going on and when, and how can you effectively keep track of it all? The simplest way is to use the online EGU program – it has options to browse sessions of interest chronologically or by discipline. You can simply click on a session or an individual presentation to add it to your personal programme. You can then view your personal program online, print it as a PDF or use the EGU2018 mobile app to keep track of your personal program on the go – scan the QR code to download it or click here from your smartphone. The app also has a handy map feature, which can be a great help navigating such a large venue! Don’t forget to keep track of the twitter hastag #EGU18 to see what is happening on a second by second basis and also the @EGU_CR twitter feed and hashtag #CryoEGU18 for cryo-info! Urm… so I’m in Vienna – where is the conference centre? The registration fee to the General Assembly includes a public transportation ticket. The public transportation ticket is valid Monday–Friday, 9–13 April 2018. More info on travel can be found here. Social events for Early Career Cryosphere Scientists! So you have spend your days at EGU absorbing plenty of science… but there is another very important aspect to conferences – they are a great place to socialise! However, it can be very daunting to know how and where to meet people at such a large meeting. This year the EGU Cryosphere team are organising two social events joint with APECS, as well as a lunch for anyone who is interested in joining our blog/social media team. Come along, meet some new people and enjoy some tasty food and a cold beer or two! The conference icebreaker can be a daunting experience to attend alone but it is a great event to go along to. We are organising a friendly pre-icebreaker meet up for cryospheric ECSs. We will meet up, have a chat, eat some cake and then head to the EGU conference centre together in time for the main icebreaker. Keep your eyes on the Facebook event for more details! Please fill out Doodle poll to give us an idea of numbers! When and Where: Wednesday lunchtime (12:15), on the left when looking at the main entrance. Come along for an informal lunch meeting if you are already — or interested in getting — involved in the EGU Cryosphere team (which includes this blog and out social media channels). We will meet on the left of the main entrance to the conference centre at 12:15 and then we will decide on where to go depending on the weather. Don’t forget to bring your lunch with you. Please email Sophie Berger for more details. As well as the scientific sessions, did you know there are also other sessions called “short courses” at EGU? Short courses provide a great chance to learn about a topic, skill or piece of software that has been on your to do list, so why not drop by and meet the experts who have kindly agreed to participate and share their knowledge? There are many courses running at EGU this year – we have highlighted a few below, but be sure to check out the full list in the online program (see above) as well as this helpful guide to “Session of special interest to Early Career Scientists (ECS)” published by EGU. Held first thing on Monday morning, this could be just the session you need to get your week off to a productive start! Help! I’m presenting at a scientific conference! 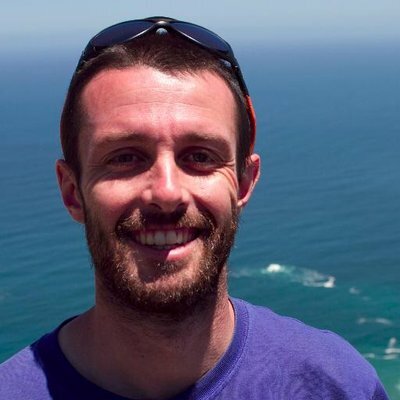 Presenting at a scientific conference can be daunting for early career scientist and established. How can you optimally take advantage of those 12 minutes to communicate your research effectively? How do you cope with nervousness? What happens if someone asks a question that you don’t think you can answer? Come along to this short course on the Monday of EGU for some tips, tricks and advice! If you can’t make it on the day, but want to see what our panelists have to say, follow the #CryoEGU18 hashtag for a live-tweet of the event! The news media is a powerful tool to help scientists communicate their research to wider audiences. However, at times, messages in news reports do not properly reflect the real scientific facts and discoveries, resulting in misleading coverage and wary scientists. In this short course, co-organised with the CL and CR divisions, we will bring together science journalists and researchers with experience working with the media to provide tips and tricks on how scientists can better prepare for interviews with reporters. an undergraduate or postgraduate (Masters/PhD) student or a scientist who has received his or her highest degree (BSc, MSc, or PhD) within the past seven years (where appropriate, up to one year of parental leave time may be added per child). However, everyone is of course more than welcome to come along and attend the short courses and social events organised by your ECS team, the more the merrier! Take advantage of the lunch breaks and go for a walk! When you exit the main conference building turn left and head for the river, or turn right and you will find that behind the concrete buildings there is a very nice park. Don’t get star-struck by a “big name” scientist you have always wanted to talk to – remember they are just humans (and usually friendly)! Go and introduce yourself and tell them what you do – the afternoon poster session is often a good chance to do this! Go to a session outside your field or area of interest. Even in completely different research topics, similarities in methods or applications can inspire you to think differently about your own research. Explore Vienna and treat yourself to a bit of time off to recover during the week. It is more important to pay attention to the sessions you do attend than attend ALL of the possible sessions. Did you know a Vienna U-Bahn ticket is included in the registration fee? Jump on a train the centre of town and go for a stroll! Image of the Week – Vibrating Ice Shelf! If you listen carefully to the Ekström ice shelf in Antarctica, a strange sound can be heard! The sound of a vibrating truck sending sounds waves into the ice. These sound waves are used to “look” through the ice and create a seismic profile of what lies beneath the ice surface. Read on to find out how the technique works and for a special Cryosphere Christmas message! 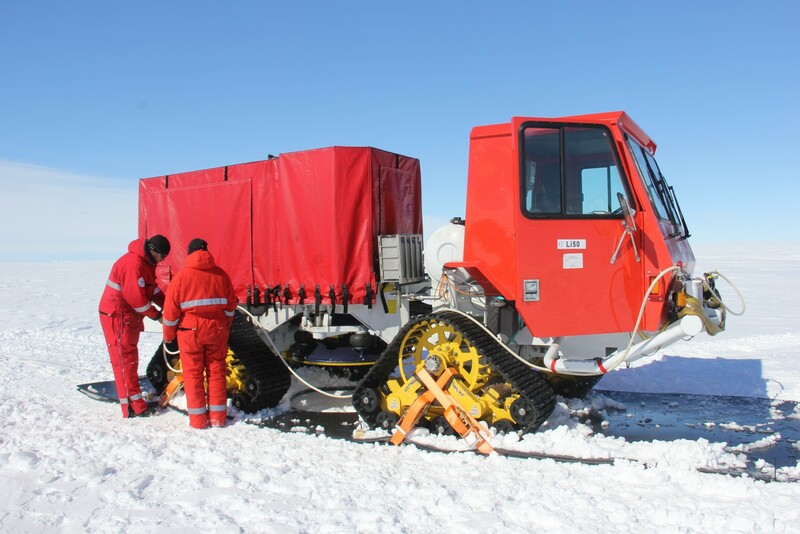 What are we doing with this vibrating truck on an ice shelf? 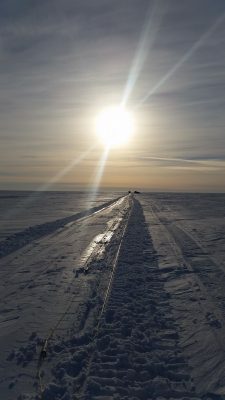 In early December a team from the Alfred Wegener Institute (AWI) made a science traverse of the Ekström ice shelf, near the German Neumayer III Station. Their aim was to make a seismic survey of the area. The seismic source (sound source) used to make this survey was a vibrating truck, known as a Vibroseis source (Fig. 2). It has a round metal plate, which is lowered onto the ice-shelf surface and vibrates at a range of frequencies, sending sound waves into the ice. When the snow is soft the plate often sinks a little, leaving a rather strange “footprint” in the snow (Fig. 3). Fig. 3: The “footprint” of the Vibroseis truck plate in the snow [Credit: Olaf Eisen]. The sound waves generated travel through the ice shelf, through the water underneath and into the rock and sediment of the sea floor, they are reflected back off these different layer and these reflections are recorded back on the ice surface by a string of recording instruments – geophones (Fig 1). There are sixty geophones in a long string, a snow streamer, which can be towed behind the truck as it moves from location to location. By analyzing how long it takes the sound waves to travel from the source to the geophones an “image” of the structures beneath the ice can be made. For example, you can see a reflection from the bottom of the ice shelf and from the sea floor as well as different layers of rock and sediment beneath the sea floor. This allows the team to look into the geological and glaciological history of the area, as well as understand current glaciology and oceanographic processes! 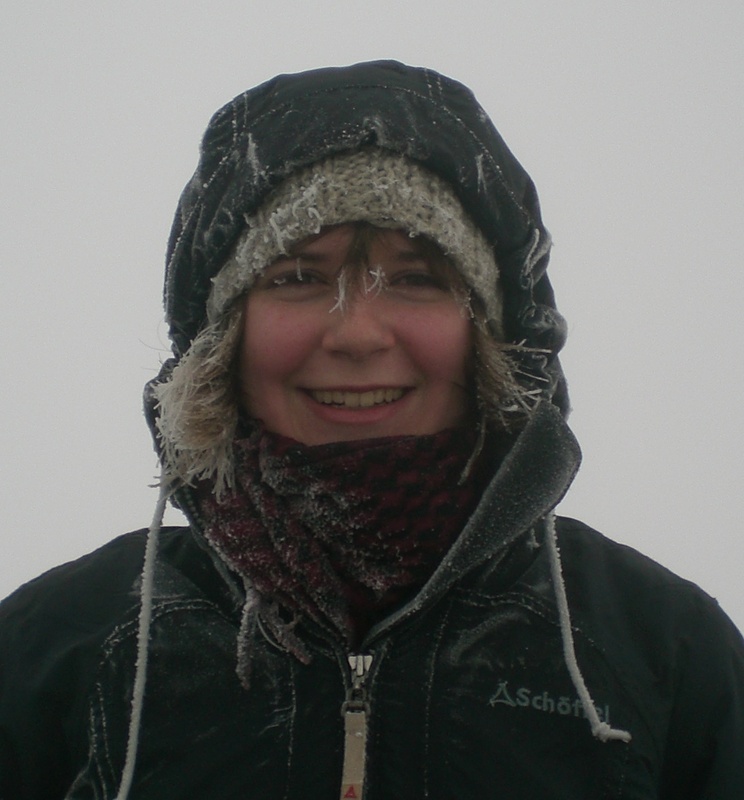 As it happens, the team from AWI consists of your very own EGU Cryosphere Division President, Olaf Eisen and ECS Rep, Emma Smith! 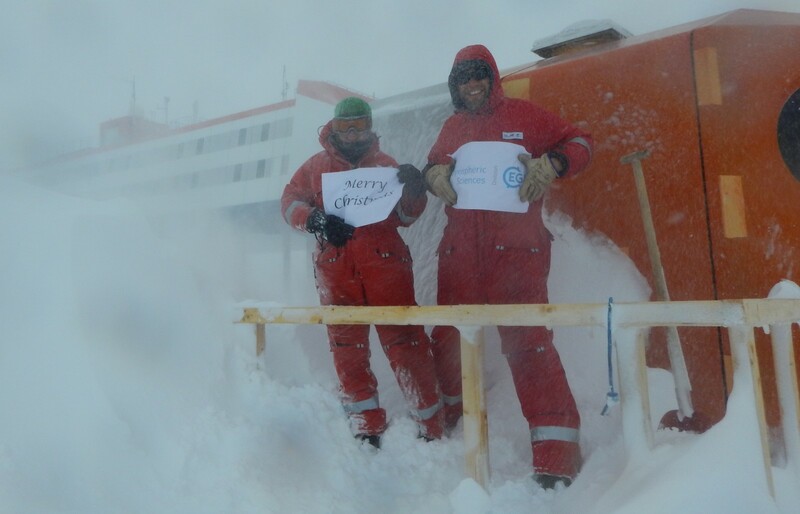 As this is the last post before Christmas, we wanted to wish you a merry Christmas from Antarctica! The first week of the Climate Change summit in Bonn (COP 23 for those in the know) has been marked by Syria’s decision to sign the Paris Accord, the international agreement that aims at tackling climate change. This decision means that the United States would become the only country outside the agreement if it were to complete the withdrawal process vowed by President Trump. The volume of Arctic sea ice has declined over the last 4 decades and reached a record low in September 2012. 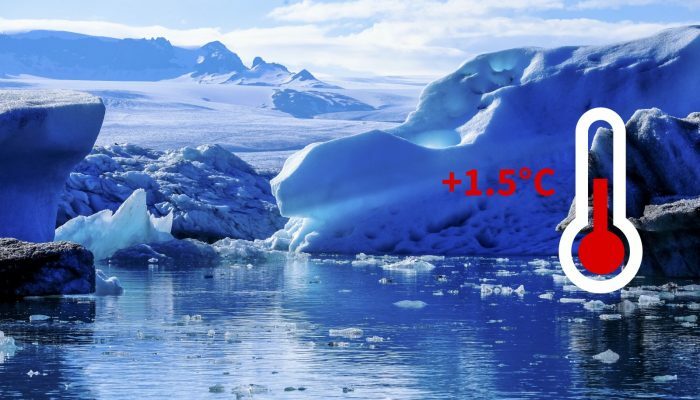 Shrinking sea ice has major consequences on the climate system: by decreasing the albedo of the Arctic surface, by affecting the global ocean circulation, etc. Both the Antarctic and Greenland ice sheets have been losing ice since 2002, contributing to global sea-level rise (see previous post about sea level) . An ice loss of 100 Gt raises the sea level by ~0.28 mm (see explanations here). Finally we could not close this post without showing how the concentration of carbon dioxide have evolved over the same period and how this has led to global warming. Fig. 1: Greenland is slightly bigger than Austria, Belgium, Denmark, France, Germany, Ireland, Italy, Poland, Portugal, the Netherlands and the United Kingdom together [Credit: The True Size]. Greenland is a critical part of the world, which is regularly covered on this blog, because it hosts the second largest ice body on Earth – the Greenland Ice Sheet. 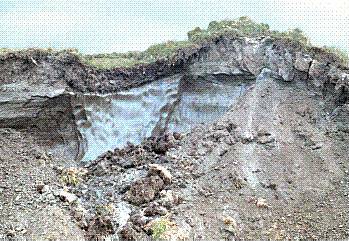 This ice sheet, along with its small peripheral ice caps, contributes by 43% to current sea-level rise. We could simply tell you that Greenland stretches over ~2 million km². For most people, this figure would however not speak for itself. Luckily, The True Size is a web application that comes to our rescue by enabling us to compare the true size of all the countries in the world. As we can see in Fig. 1, Greenland is in fact only slightly bigger than Austria, Belgium, Denmark, France, Germany, Ireland, Italy, Poland, Portugal, the Netherlands and the United Kingdom together. 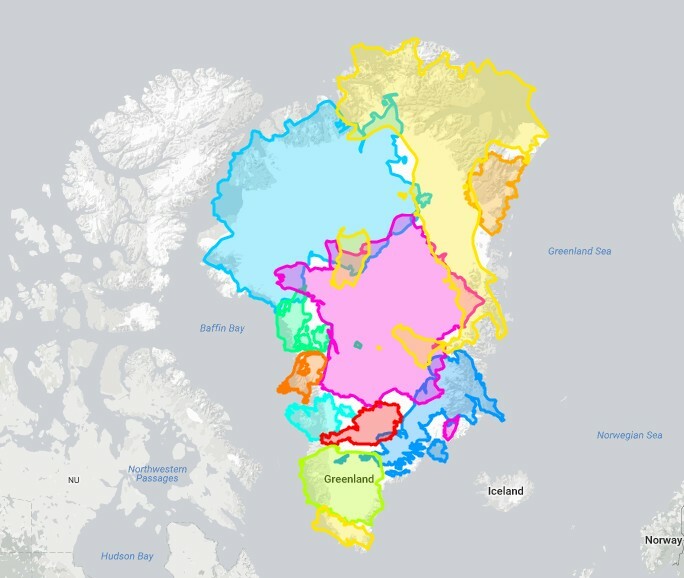 Greenland is therefore big but not as big as what is suggested by the most common maps (Fig. 2). As a result, one can therefore wonder why the most popular world maps distort the size of the countries. To map the world, cartographers must project a curved surface on a flat piece of paper. There are different approaches to do so but all distort the earth surface in some ways. For instance, conformal projections preserve angles and shapes but change the size of the countries, whereas equal-area projections conserve the sizes but distort the shapes. As a result, a map projection that suits all purposes does not exist. Instead, the choice of the projection will depend on the use of the map. 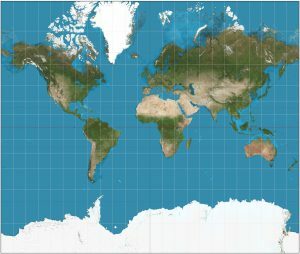 The most popular projection, the Mercator projection (Fig. 2), is used by many online mapping applications (e.g. google maps, OpenStreetMap, etc.). In Mercator maps, the Earth’s surface is projected on a cylinder that surrounds the globe (Fig. 4). The cylinder is then unrolled to produce a flat map that preserves the shapes of landmasses but tends to stretch countries towards the poles. This is why the size of Greenland is exaggerated in many world maps. Why does google map use the Mercator projection then? 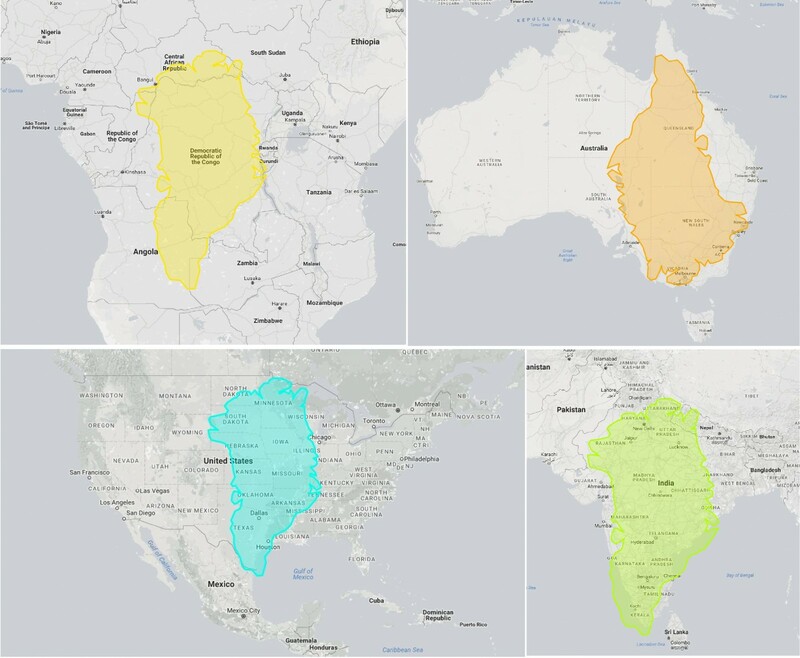 If Google Maps and other web mapping services rely on the Mercator projection, it is not to make countries at high latitudes appear bigger, but, because those tools are mainly intended to be used at local scales. The fact that the Mercator projection preserves angles and shapes therefore ensures minimal distortions at the city-level: two perpendicular streets will always appear perpendicular in Google Maps. This is not necessarily the case at high latitudes with projections that preserves areas (as can be seen here). Interested in this topic? Then, you might enjoy this video ! Image of the Week – See sea ice from 1901! 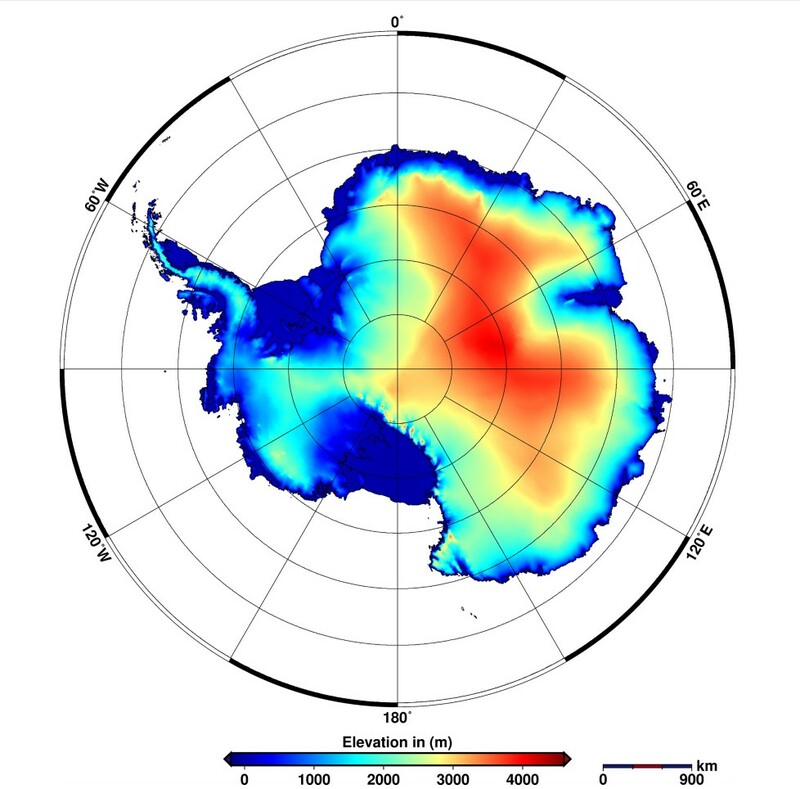 The EGU Cryosphere blog has reported on several studies of Antarctic sea ice (for example, here and here) made from high-tech satellites, but these records only extend back to the 1970s, when the satellite records began. Is it possible to work out what sea ice conditions were like before this time? The short answer is YES…or this would be a very boring blog post! Read on to find out how heroic explorers of the past are helping to inform the future. 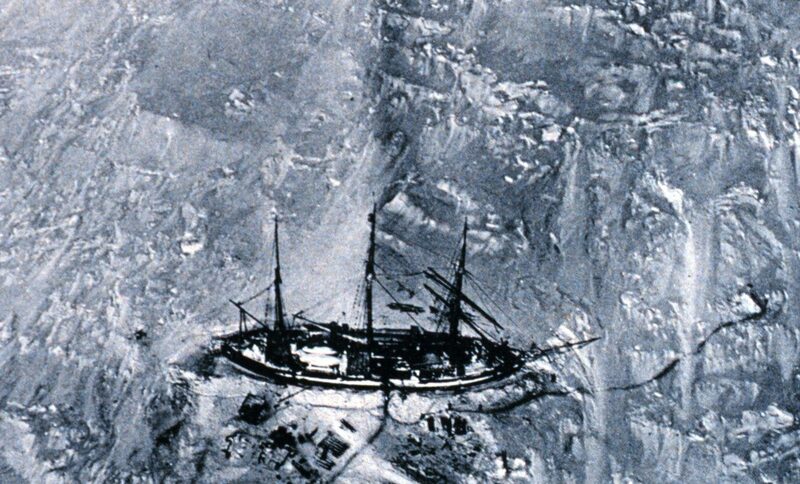 During the Heroic Age of Antarctic Exploration (1897–1917), expeditions to the “South” by explorers such as Scott and Shackleton involved a great deal of time aboard ship. Our image of the week shows one such ship – the ship of the German Erich von Drygalsk – captured from a hot air balloon in 1901. These ships spent many months navigating paths through sea ice and keeping detailed logs of their observations along the way. Climate scientists at the University of Reading, UK have used these logs to reconstruct sea-ice extent in Antarctica at this time – providing key information to extend satellite observations of sea ice around the continent. Why do we want to know about sea-ice extent 100 years ago? In the last three decades, satellite records of Antarctic sea-ice extent have shown an increase, in contrast to a rapid decrease in Arctic sea-ice extent over the same period (see our previous post). It is not clear if this, somewhat confusing, trend is unusual or has been seen before and without a longer record, it is not possible to say. This limits how well the sensitivity of sea ice to climate change can be understood and how well climate models that predict future ice extent can be validated. To help understand this increase in Antarctic sea-ice extent; records of ice composition and nature from ships log books recorded between 1897–1917 have been collated and compared to present-day ice conditions (1989–2014). The study reported here builds on international efforts to recover old weather and climate data from ships’ logbooks, check out oldweather.org. 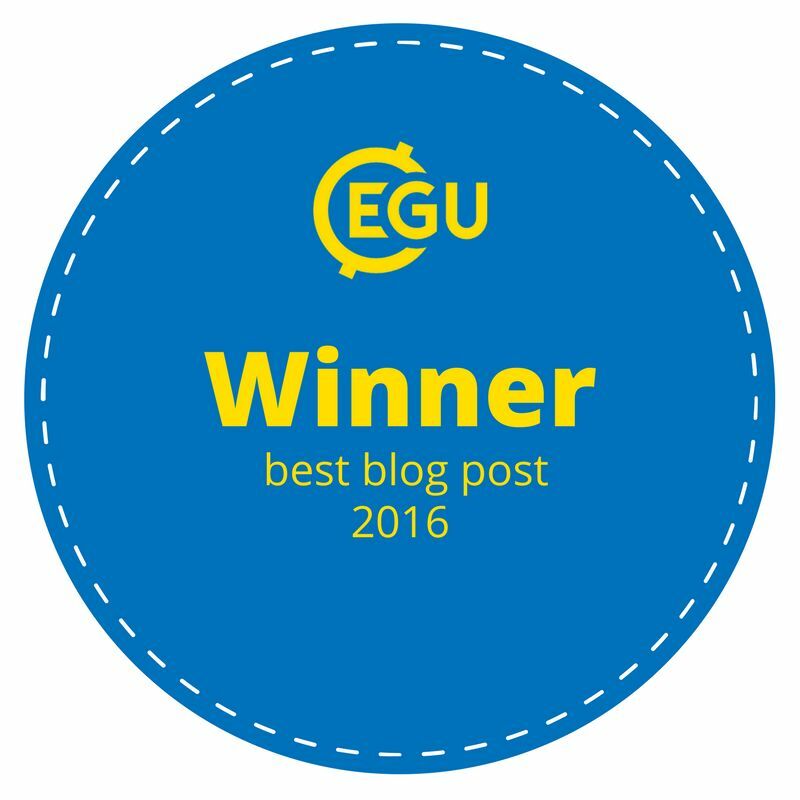 This is modified version of a “planet press” article written by Bárbara Ferreira and originally published on 26th November 2016 on the EGU website . It is also available in Dutch, Hungarian, Serbian, French, Spanish, Italian and Portuguese! All translated by volunteers – why not consider volunteering to translate an article and learn something interesting along the way? When I think of snow, I tend to either think about the bright white ski slopes in the mountains or the large white areas in the Arctic. However, natural phenomena can lead to colorful snow. Our Image of the Week shows snow can be green! Snow can also turn orange, pinkish, grey and even yellow… But where do these different shades of snow come from? The most common color of snow is white (see Fig. 2). Snow generally appears white when it is pure snow, which means that it is only an aggregate of ice and snow crystals. 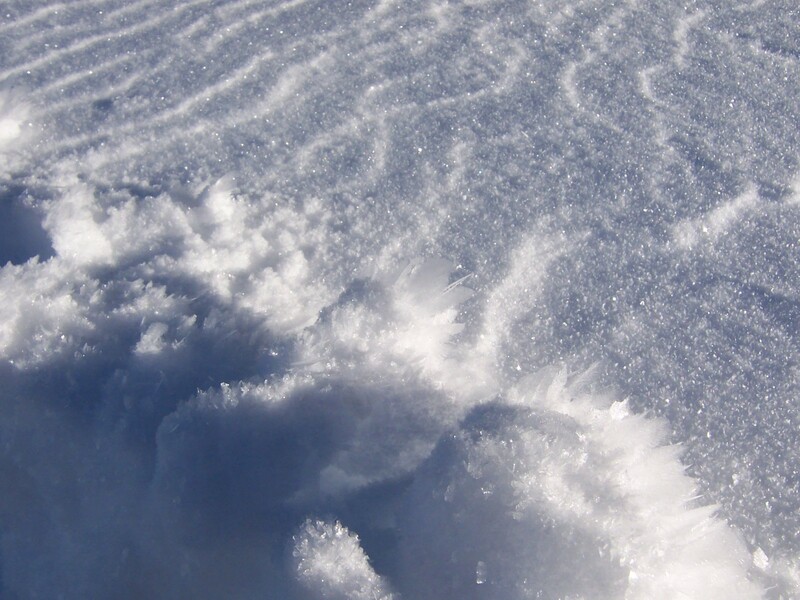 When sunlight meets the snow surface, all frequencies of the sunlight are reflected several times in different directions by the crystals, leading to a white color of the snowpack. Snow can obtain a green color if it is host to an algal bloom (see our Image of the Week). 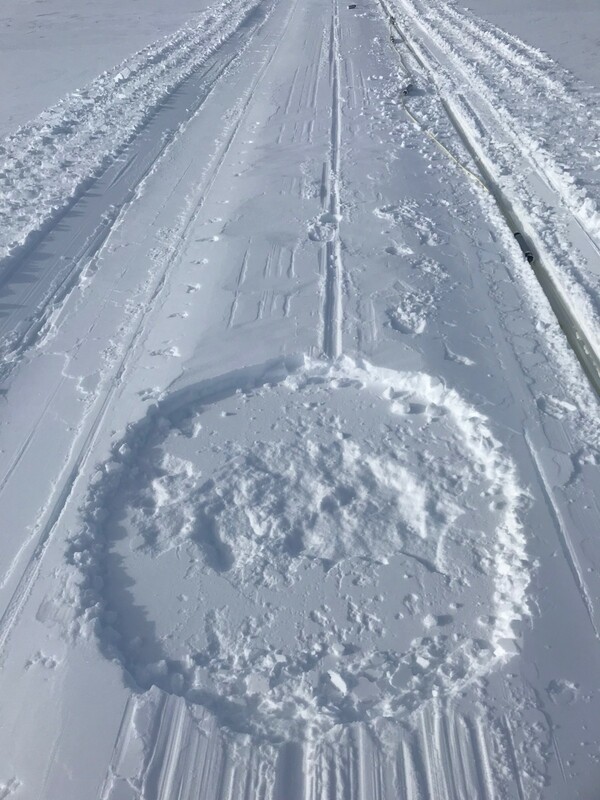 Depending on the wetness of the snow, sunlight conditions and nutrient availability, unicellular snow algae can develop and thrive on the snow. 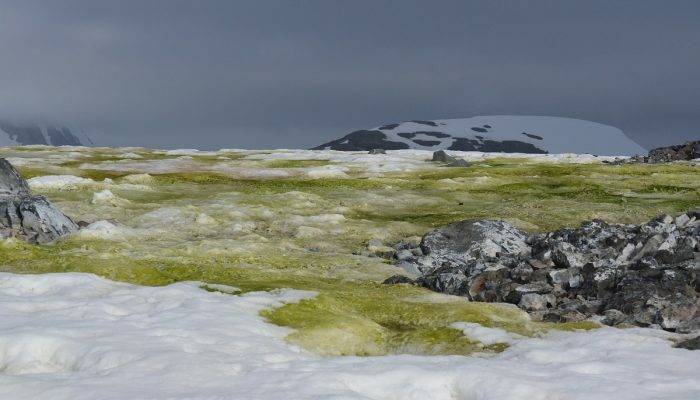 Although it is not clear exactly how fast snow algae grow, algae populations from temperate regions have been found to grow sixteen-fold in one day! As the algae population increases, the snow turns green as the algae reflect the green light back. 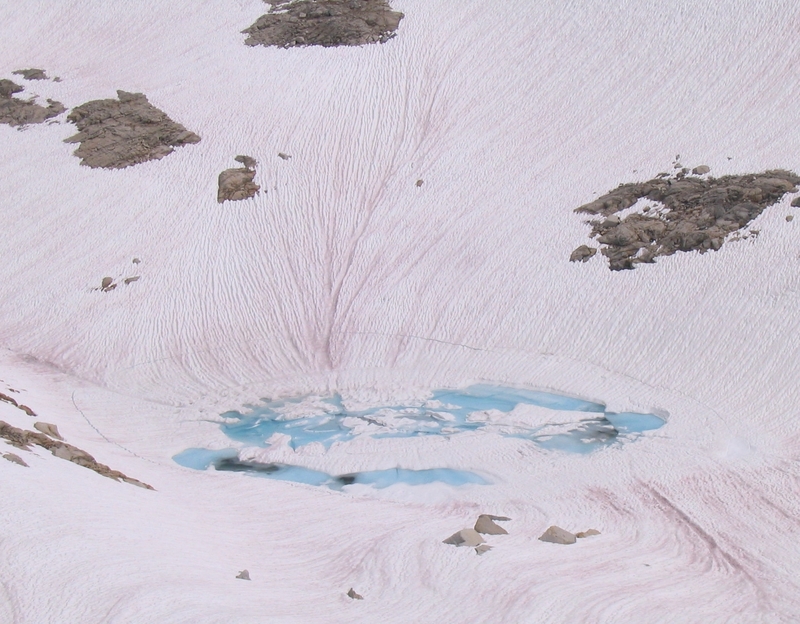 The pink-red-colored snow, commonly called “watermelon snow”, can also be caused by snow algae (see Fig. 3). The snow algae responsible for the pink color are similar to the ones responsible for green color. However, these algae use pigments of red color to protect their cells from high sunlight and UV radiation damage during the summer. Just like how we use sunscreen to protect our skin! The red pigments come either from iron tannin compounds or, more commonly, from orange to red-pigmented lipids. There is also another origin for pink snow: Penguin poo! Indeed, the krill they eat contain a lot of carotenoids that give their poo a red color. Fig. 3: Watermelon snow streaks [Credit: Wikimedia Commons]. Yellow snow is the result of a different process (and no, it is not from Penguin pee!). Fig. 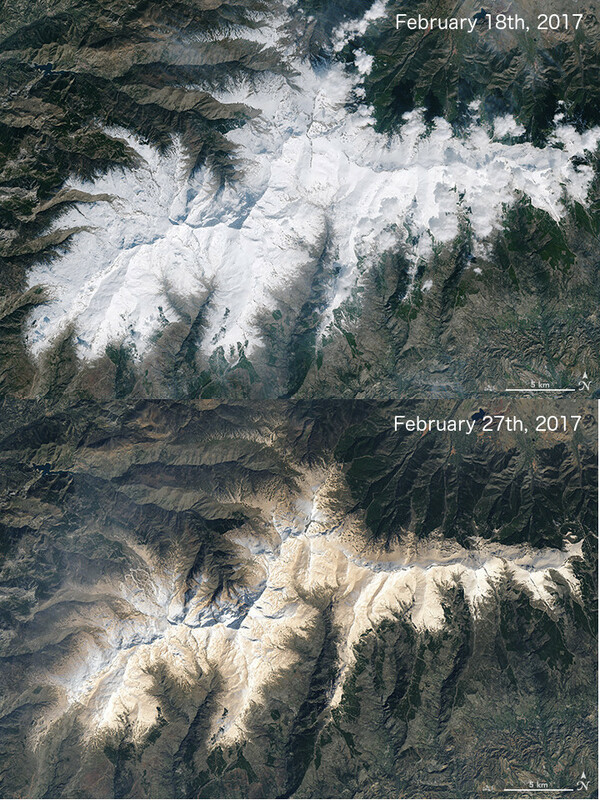 4 shows the Sierra Nevada in Spain before and after dust transported from the Sahara settled down on the snow-covered mountain tops. The dust was lifted up from the Sahara desert and blown north before ending its trip in Spain. Do these colors have an influence on snow cover? Lutz, S. et al. (2016): The biogeography of red snow microbiomes and their role in melting Arctic glaciers. Nat. Commun. 7:11968, doi:10.1038/ncomms11968. When it comes to climate change, the Arctic and the Antarctic are poles apart. At the north of the planet, temperatures are increasing twice as fast as in the rest of the globe, while warming in Antarctica has been milder. 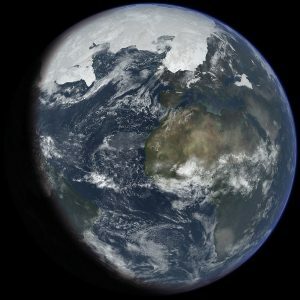 A recent study published in Earth System Dynamics shows that the high elevation of Antarctica might help explain why the two poles are warming at diﬀerent speeds. At and around the North Pole, in the Arctic, the ice is mostly frozen ocean water, also known as sea ice, which is only a few meters thick. In the Antarctic, however, the situation is very diﬀerent: the ice forms not just over sea, but over a continental land mass with rugged terrain and high mountains. 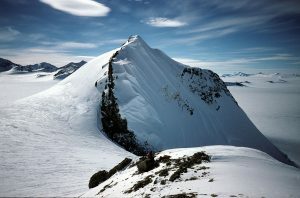 The average height in Antarctica is about 2,500 metres, with some mountains rising as high as 4,900 metres. Marc Salzmann, a scientist working at the University of Leipzig in Germany, decided to use a computer model to find out what would happen if the elevation in Antarctica was more like in the Arctic. He discovered that, if Antarctica were ﬂat, there would be more warm air ﬂowing from the equator to the poles, which would make the Antarctic warm faster. As Antarctica warms and ice melts, it is actually getting ﬂatter as time goes by, even if very slowly. As such, over the next few centuries or thousands of years, we could expect warming in the region to speed up. A longer version of this article exists on the EGU website : ‘Press Release: Flat Antarctica – Land height could help explain why Antarctica is warming slower than the Arctic‘.